We continue reviewing hard drives with the IDE interface released in 2002 and today we will speak about the Seagate Barracuda ATA V.
As you can see, the appearance hasn't changed much. Those who are interested in what has changed in the new generation of the Barracuda ATA can take a look at the brief comparative review. 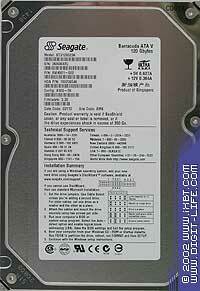 The line includes drives of 40, 60, 80 and 120 GB, the latter model has two versions: with a 2MB and 8 MB cache. Ultra ATA/100 or Serial ATA interface. Density: 60GB per platter. 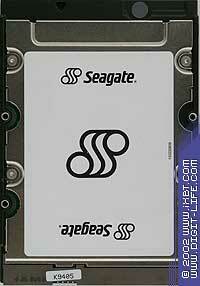 We'll speak about the drives with the serial interface later, and now we are testing the ST3120023A model of 120GB. The fastest drives of the previous generation - IBM IC35L120AVVA07-0 (DeskStar 120GXP) and Western Digital WD 1200JB with a 8MB buffer, as well as Maxtor DiamondMax Plus8 (6E030L0) and DiamondMax Plus9 (6Y060L0) reviewed in the first part - were chosen as competitors. Further, just for convenience I will use the line's name instead of the drive's codename where possible. The new Barracuda has an inferior linear read speed compared to the Seagate's solutions with 80GB per platter and even to the IBM's and WD's drives of 40GB per platter. It seems that the engineers of the company decided to increase the track density - it's proved in the comparative review. Some parts of the graph are saw-like, though there are no considerable drops, that is why it won't tell upon the read speed. At the average speed the Barracuda is not a leader either, though the drives of this series had a very high exchange rate at the very beginning. On the contrary, the access time is excellent, it's even better than specified. The scores are average, not unacceptable. Let's see what the Intel IOMeter can tell us; this is the most objective test in my, and not only, opinion. In the Intel IOMeter benchmark the new Barracuda has perfect marks; there is only the IBM 120GXP ahead. In case of big loads the WD 1200JB also has a small advantage. In this connection it would be interesting to test the Barracuda ATA V with a 8MB buffer. I'll try to do it. 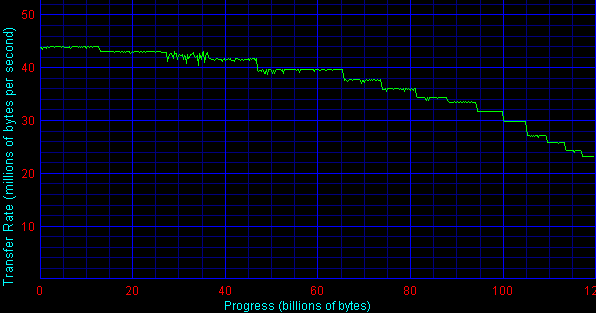 Here, it is exactly the buffer size that allows the WD1200JB to reach this level. So, Seagate launched one more good drive. The performance is not much greater compared to the previous generation, but the test scores are very good.